3 of 21: It is not going to be okay...It is going to be INCREDIBLE!! It is not going to be okay...It is going to be INCREDIBLE!! If we could change her in any way-we would not. Down syndrome became a part of our family in June of 2011 and we have all been forever changed and blessed. What an amazing ministry! We reached out to ask what we could do to help. 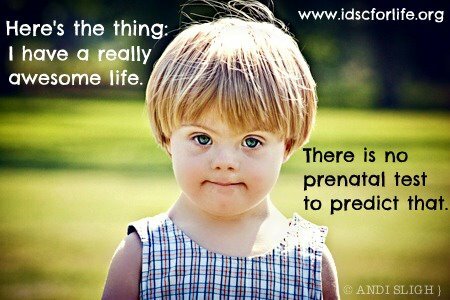 We have always been saddened by the abortion rate, but even more saddened by the abortion rate of children with Down syndrome. If only people really understood what Down syndrome really looked like, things just might be different. Statistically, every 20 seconds in America, an innocent child loses their life at the hands of an Abortionist. Abortion will NOT be stopped at the voting booth and history has shown this time after time. It will take local grassroots movements from God's people in every city across the country. We as Christians can no longer feel satisfied simply voting Pro- Life, we must live Pro-Life. Every20seconds.org is not a protest group. It is a rally cry for the church to stand up and love outside the walls. God clearly defines his love for children in the Bible, and now we have to ask ourselves, what is the life of a child worth to us? It only takes a few to make a big difference. and doing all the things other toddlers do. "Congratulations, you are one of the lucky ones. You are about to experience the most amazing journey that only a parent of a child with Down syndrome gets to experience."